I like to serve a big bowl of these greens alongside a grainy slice of grilled or toasted bread, preferably spread with a Cypress Grove goat cheese. Now that’s a proper meal. 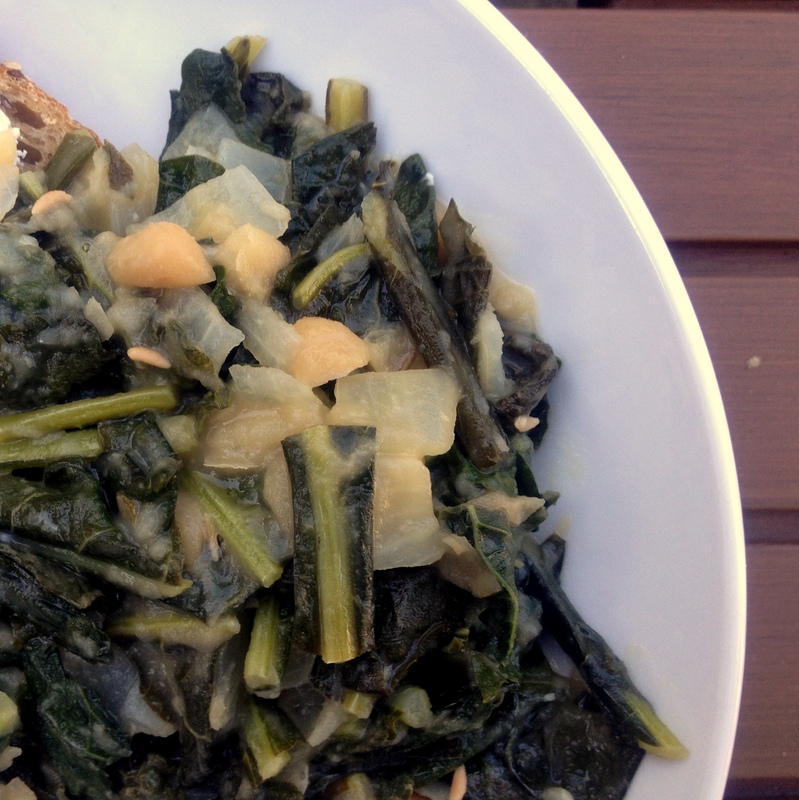 Beans and Greens: First, wash and evaluate your greens. If the greens are tough, like collard greens or old curly kale, you may want to simmer the leaves in salted water for about five minutes before draining and chopping them. If they are fairly soft, like chard or beet greens or lacinato kale, just chop them without cooking them first. Finely dice a small onion and saute it in olive oil with a minced clove of garlic, the minced leaves from a big sprig of rosemary, and a few shakes of red pepper flakes. Cook until onion is soft, then add 1/2 c. white wine and cook down until thick and syrupy. Add lots of chopped greens and a few cups of cooked white beans (with the cooking liquid if you cooked the beans yourself; otherwise drain and rinse canned beans and add a little water if you want the mixture soupier). Season with salt and pepper and cook, stirring occasionally, until the greens are tender and the liquid in the pan has reduced to a saucy consistency. Serve topped with grated Parmesan cheese if desired. Perfect. Just what need. I have a ton of broccoli and cauliflower greens to use up!! Thanks for sharing. Thanks for sharing your method. We have beans at least once a week, either beans and greens or “frijoles con todos” with variable “todos.” The rosemary and white wine are a nice touch which I will try soon. Really enjoying your blog, Emily! Thanks, Erin! I’m glad you’re enjoying it–I am too. I hadn’t written anything for so long, and the last things I wrote regularly were legal briefs, so this topic is a bit juicier. :) What are the “todos” with your frijoles? I always want to hear about other people’s good ideas! Perfect and exactly what will be for dinner since today is CSA day, cold and rainy and I’ve got beans cooking in the slow cooker. BUT can we have the sticky black rice pudding tomorrow, pretty please! Have a big bag of black rice and am looking to do something with it. This looks great and all (truly), but let’s get back to the cookies and rice pudding you mentioned. Protein schmotein. Yay, this came up last night while I was taking a break from feverishly scrubbing my dryer and there wasn’t ANY content. Mmmm. I need this for dinner tonight! No worries! And by the way, I do love your posts and they are entertaining! Looks great. And I love the recipe for ice cubes! One of the most popular recipes on epicurious is for boiled water :-) So, yes, I think ice cubes count! That is not true!!! Is it? I hope that the person on a restricted sodium diet was able to find a substitution. And I agree with the commenter who pointed out that the recipe was a little vague. You are right crusty bread with a little cheese and this dish would be heavenly! Another keeper! This dish makes a regular appearance around here, we love it! That sounds great! I have seen a recipe that does that with huge white beans but I’ve never tried it. It sounds wonderful from your description–a crispy edge and creamy bean interior, yum. Thank you for the suggestion! I love this! Thanks so much for stopping by on my blog and sending me here. I can’t wait to see what else you have cooked. You are amazing!